At Life's End, A Final Home On The (Shooting) Range Many people keep the cremated remains of a loved one in an urn or scatter the ashes over a favorite place. 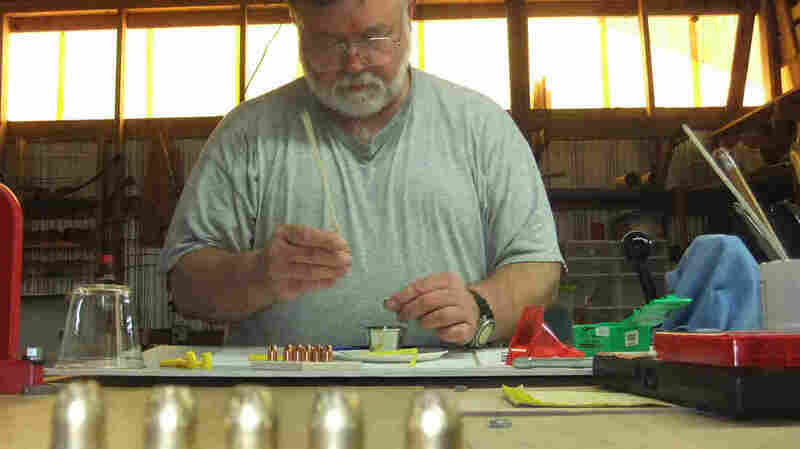 But one company in Alabama has pioneered a new twist to honor the dead: It will put your beloved's ashes into ammunition. Tony Landenwish loads ammunition with cremated remains for Holy Smoke in Stockton, Ala. The bullets are used as an alternative to scattering a loved one's remains in a special place or putting them in an urn on the mantel. Many people keep cremated remains in an urn on the mantle or scatter their loved one's ashes over a sacred place. Now, a company has pioneered a new twist: putting cremated remains into ammunition. Thad Holmes and Clem Parnell, who founded Holy Smoke last year, say business is picking up, and they've received orders from as far away as South America and Europe. For $850, Holy Smoke will take cremated remains and put them into various types of shotgun shells and bullets for rifle and pistol shooters. 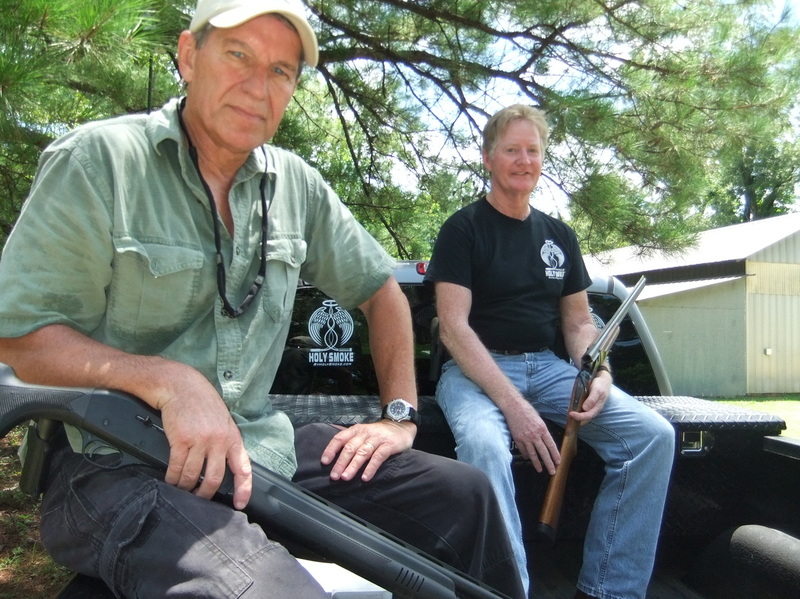 The Stockton, Ala., company was started a year ago by two state game wardens. Literally and figuratively, Holy Smoke's business is "booming." Clem Parnell, a co-founder, thought the families of the dead should have a livelier method to honor those who enjoyed the outdoors. "Wouldn't it be cool to put some ash in a shell, to the point of a 250-round case of shells, and all his friends could go out and have a day on the range and celebrate the way this guy used to be?" Parnell says. "The way he was when he was alive — vibrant and enjoying life." For Priscilla Isler, it was perfect. Her husband, Glenn, was a hunter at heart and he started young. His dad died when he was 10, leaving him and his mom, and nine brothers and sisters. Glenn took to the fields and forests to hunt for food. "They're scrambling to make a living and sustain and feed the family," Priscilla says. "Glenn would go off into the woods and he'd come back with two rabbits and [his mother would] say, 'Praise the lord, we're having meat tonight.' So it was truly in his blood." Over the years, Glenn Isler tried to pass that on. He took a lot of young people on their first hunts and hoped one day to open a school to teach underprivileged kids a love for the woods and how to hunt safely. But he did not live long enough, so his wife decided to honor his life by having Holy Smoke put his ashes into ammunition. At the company's headquarters, Tony Landonwich sits at a loading table. Wearing protective eyewear, he loads a set of the special rounds. "We use a hollow-point bullet," Landonwich says. The ashes are added and then it's loaded like any other bullet or shell. Getting started wasn't easy. There were many hurdles, such as obtaining county and state licenses and permits from the Bureau of Alcohol, Tobacco, Firearms and Explosives. But business is picking up. The company's other co-founder, Thad Holmes, says Holy Smoke averages about one new order a week from coast to coast. "By no means are we taking the place of a funeral or cremation," Holmes says. "Everything we offer is for after the funeral and after the mourning has been done." For Priscilla Isler, firing bullets with her husband's ashes tucked inside is not about mourning but celebration. She even used a few round rounds to kill a wild pig that her family ate for their Fourth of July cookout. As she fires off a round containing Glenn's ashes near the fountain in her backyard, she says she loves being able to see the ashes as they fall back to earth. "It's beautiful that you can see it dispersing and falling, that is just fabulous," she says. Isler says she can't imagine any other way to honor her husband's life than firing a bullet so he goes out with a bang.